Maybe plans fell through and now you’re sitting with your head in your hands, praying for a Christmas miracle. 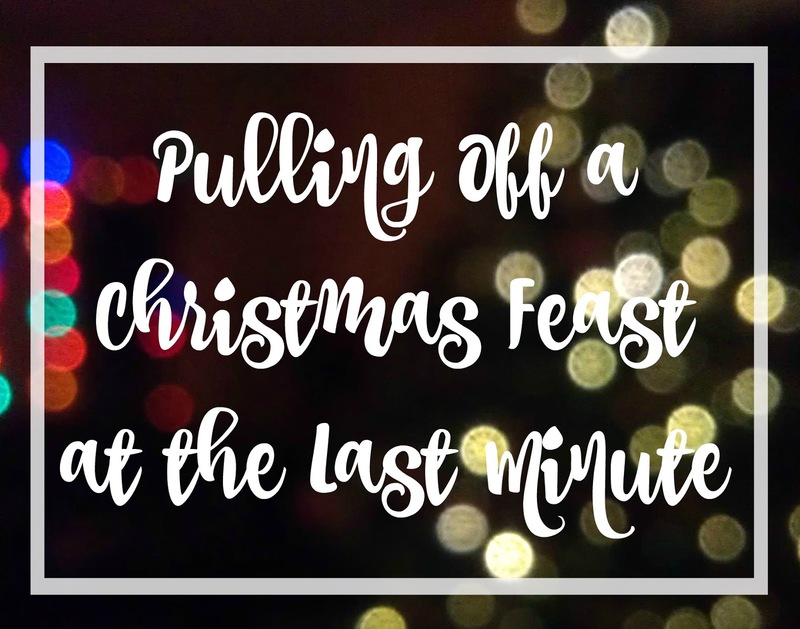 If you just found out you’re in charge of this year’s Christmas feast—for whatever reason—don’t panic. Okay, panic a little! Is it out of your system? Good. Now it’s time to get down to business. Contrary to what you’re probably thinking, it is actually possible to pull off a delicious feast with limited time—it just takes a bit of foresight and a lot of patience. Follow these tips and throw a dinner party your loved ones will enjoy to the fullest this Yuletide season. You can’t pull this off alone. If people offer help, accept it. Whether it’s your hubby, the kids, cousins, or even neighbors, it will take a village to pull this meal off. Hire a cleaning service to come and pick up the house the day before, and focus your energy on shopping for the food. Take someone with you to the grocery store, with separate shopping lists so you can quickly divide and conquer. Hint: Purchase pre-chopped veggies and fruits to make life easy. If you have any overnight guests staying with you, put them to work on decorations while you’re out shopping. You’ll likely make some awesome memories working together to pull this miracle off, and it will be a great story to tell for years to come. Tasty appetizers are awesomely easy. Throw together a sophisticated charcuterie plate your guests will devour. Throw out some chopped veggies for an extra injection of healthy options. Roll cream cheese and pickled veggies (can be pepperoncinis, asparagus, or whatever you have in your fridge or pantry) inside salami slices and hold together with a toothpick for a quick appetizer that looks elegant with little effort. If you’re panicking about finding a main dish on time, think outside the box. Maybe the turkeys at your local store are sold out, or perhaps you can’t track down a prime rib to save your life. Leave it to the experts and order a ham from Honey Baked Hams. Once plated, guests will never know you didn’t spend hours slaving away, and this main event of your feast is definitely going to be enjoyed. If you have a couple of days, you might even be able to order a ham straight to your front door. Instead of stressing yourself out making cocktails for everyone, let them mingle and do it themselves. Lay out a cocktail table filled with all the necessities; liquor of choice, champagne, wine, what have you, and things to mix with like juices, soda, etc. Lay out some straws in mason jars (who doesn’t have at least a few of those laying around the house these days?) and throw some mixing spoons down. Your table will look completely intentional, not pulled together in just a few minutes. So you may not have weeks to find the perfect table decorations, but it’s easy to get creative and decorate a table that will look like it took a month to prepare. Lay out a white table cloth and keep things simple and classic. Grab a bit of any Christmas decoration you have laying around—a garland along the center of the table is easy and looks elegant. Once you have the centerpiece taken care of, add some personalized touches. Grab some index cards and write the name of each guest, and draw a little Christmas doodle for fun (or enlist your kids to do it). Tie each card to a Christmas bauble or ornament, and place on top of the napkin. Little touches like this really pull the entire look together. If your last-minute plans also include unexpected guests, don’t panic. Peruse some modern Christmas gift ideas and order quick delivery—a lot of websites offer free rush shipping as it gets down to the wire. Some sleek décor pieces will work for anyone attending your get together, and they’ll be so impressed with your last minute thoughtfulness. You can easily spruce up your home to entertain guests with the right lighting. Grab those little tea lights, place them strategically around your entertaining space, and create a soft glow that will set the Christmas mood. Use any leftover twinkle lights to frame window panes, or intersperse on the feasting table for a meal that will light up your guests’ world. Go Ahead, Let The Kids Decorate!